This itinerary is no longer available. Please click here to see our Machu Picchu trips. Travel to Peru and discover ancient civilizations on the Quarry Trail. Wind through the spectacular Andes on this lesser-known route to Machu Picchu. Trek through breathtaking landscapes, interact with local communities and visit some of the smaller Inca archaeological sites. This action-filled express Peruvian tour gets you closer to the secrets of this elusive civilisation on a breathtaking adventure to Machu Picchu. The Quarry Trail not only offers the magnificent Andean scenery you expect on any trek in the Cusco region, but it also visits three lesser know archaeological sites on the way. This trip involves a lot of walking to see the sites.The trip is recommended for those with a moderate level of fitness. Please bring durable footwear suitable to hiking. See the ‘What to Take’ section of the trip notes for more information. You will be trekking along the Quarry Trail, so you'll be camping with basic facilities. It's not exactly the Hilton Hotel, but the rewards of the trek are great. Meet your friendly local guide at Plaza de Armas, the main square of Cusco and a place that has been the heart of the city since the time of the Incas. You’ll get to explore the square — take in the sites of the Cathedral and the Church of La Compañía, as well as all the outstanding buildings that make this plaza one of the most beautiful in the world — before officially beginning your Cusco tour. From there, you’ll wander along ancient streets to admire the dramatic Inca Walls, constructed from mammoth granite blocks, side-by-side with colonial buildings. It’s here that you’ll also get to see a famed Inca masterpiece, the 12-angle stone. Your Cusco tour will then lead you on a stroll through a beautiful small plaza, San Blas, located in Cusco’s bohemian, artistic neighborhood. It’s here where you can find several artisinal shops, a handicrafts market, and the best views of the city as night falls. Then it’s back to the order of the day: Pisco! As you wander through the city, your local guide will tell you all about the traditional Pisco Sour and its place in Peruvian history. We’ll stop off at a local bar so that you can taste a few different flavours of Pisco, and hear all about the distillation process and how this sour drink is made. Finally, it’s your time to shine! Get your mixologist hat on and try your hand at making your very own Pisco Sour, using all the knowledge that you’ve picked up along the way on this Cusco city tour. And the best part? You get to drink it afterwards — salud! In the morning, travel by private car through the Sacred Valley (approx 2 hours total drive), on the outskirts of Cusco. Known as Wilcamayo to the Incas, the lush, fertile valley has long been the main source of food for the high Andes. Maize crops can be seen surrounding the river and covering the terraces carved high into the valley walls. You will head to a community in the valley to learn about local lifestyle and activities. If our visit coincides with market day you can spend time browsing the stalls in search of hand-painted beads or warm ponchos and maybe practice some of the local language, Quechua. Later you will continue the tour visiting the town of Ollantaytambo, which was built over an ancient Inca town. This is a magnificent example of Inca urban planning and one of the few places where the Incas defeated the Spanish. Ollantaytambo's archaeological site is located to the east of the Plaza de Armas. The upper terraces of this site offer great photo opportunities of the squared grid town below. In the afternoon, you will go to the hotel in Ollantaytambo. Make an early start today and drive to Choquequilla, a small ceremonial place where Incas worshipped the moon. Drive to the starting point of the trek, Rafq'a, and meet the horsemen who join us on the hike. After an hour’s walk, reach the small community of Socma. Carry on to the Perolniyoc cascade lookout, an opportunity to stop for photos and a food break. Continue to the campsite, which is 12,140 feet above sea level. You should reach the campsite around lunchtime. After lunch, set off to explore the Q'orimarca archaeological site, which once served as a checkpoint to the Incas. This is the most challenging and rewarding day of the hike. A three hour walk takes us to the top of the first pass of Puccaqasa (approximately 14,337 feet high). After enjoying picturesque views of the valley, it’s a short walk before stopping for lunch. Afterwards, make the two hour hike to Kuychicassa, the highest pass of the trek at 47,899 feet. From here, descend to the sacred site the Incas called Intipunku (Sun Gate), with views of the Nevado Veronica mountain. Head to the campsite, only a stone’s throw away at Choquetacarpo. Today’s hike will all be downhill. 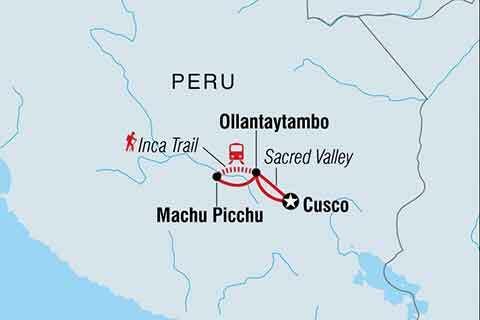 The first stop is the incomplete Kachiqata quarry, where the Incas were intercepted by the Spanish. Around midday, come to the end of the trek. Explore the cobbled streets of Ollantaytambo before taking the short train journey to Aguas Calientes. Visiting the natural hot springs in town is a soothing way to spend the late afternoon. Spend the night in a comfortable hotel before tomorrow’s visit to Machu Picchu. Depending on weather conditions, take a bus at 5:30am this morning along the winding road to Machu Picchu. The journey takes around 30 minutes. If skies are clear, enjoy a spectacular sunrise over the ancient city from the Sun Gate, before going on a guided walk around the ruins. In the evening enjoy the a Peruvian Novo-Andenean dinner and folkloric show at the Tunupa Cuzco Restaurant. Tunupa Restaurant Bar Grill, which has been operating for 10 years and is 100% owned by Cusco entrepreneurs, is located in the heart of the Main Square. From its balcony you can appreciate the beauty of the Cathedral, as well as the Haukaypata. It has a variety of Novo-Andean dishes, as well as delicious buffet meals for the enjoyment of all the visitors. You can also enjoy a live show and an ancestral dance performance. Your tour comes to an end today and there are no activities planned. Air conditioned vehicle transfers throughout. Due to the demands of traveling at high altitudes, a Passenger Self Assessment Form is required for this trip.